Sometimes suspended ceiling projects require knowing more than the basic knowledge of the average ceiling installer. With the variety of different ceiling grid configurations that can be built, additional skills are generally needed because the project can vary greatly in complexity. 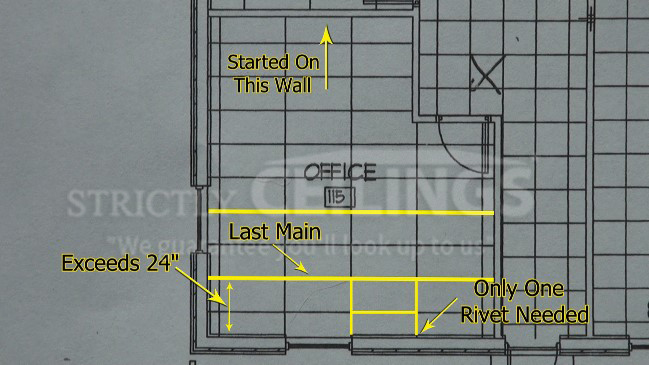 Let’s go over some ways to refine your drop ceiling grid installation skills. Review any plans that may be available to you. This will allow you see where light locations will be and any vertical drops that may need to be built. Assess ductwork before installing so that there isn’t a conflict with the wire and main runner installation. 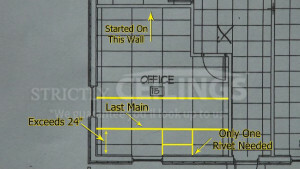 Review the ceiling grid system that you are installing. Some systems are “Hook” and some are “Stab” systems. 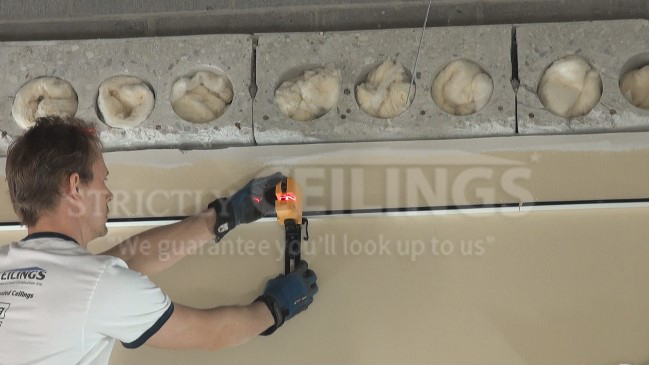 Hook systems are able to be taken apart much easier than stab and this may prove to be a valuable asset while installing as you may need to remove some cross tees in order to install some ceiling tiles. Use tools that are best suited for this type of installation. Make sure that your tin snips are new and sharp. There is a lot of metal to cut in a drop ceiling. Review checklist for tools required. It’s best to always use a self-leveling laser to install the ceiling track. This will ensure the most professional installation. Never install drop ceiling wires more than 4 lineal feet apart from each other. 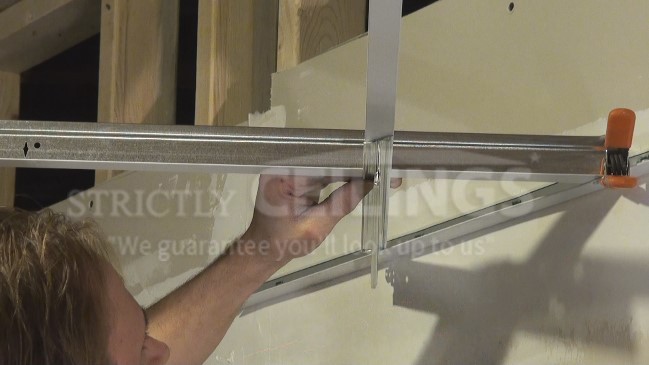 Always rivet the ceiling grid system to the wall angle to prevent movement while installing. Never level the main runners unless the cross tees have been cut into the wall and have been secured. Never secure or rivet any main runners until the ceiling grid has been squared. Square for 15/16” ceiling grid for the 4×4 method is 66 3/8”. Square for the 2×4 method is 52 ¼”. Always pull the slack out of the ceiling wires before tying them to the main runners. This will prevent the suspended ceiling from sagging later on. When installing the perimeter wall angle, make sure that the angle is flat up against the wall. If not, use your tin snips and relieve cut the angle to allow for the wall imperfection. 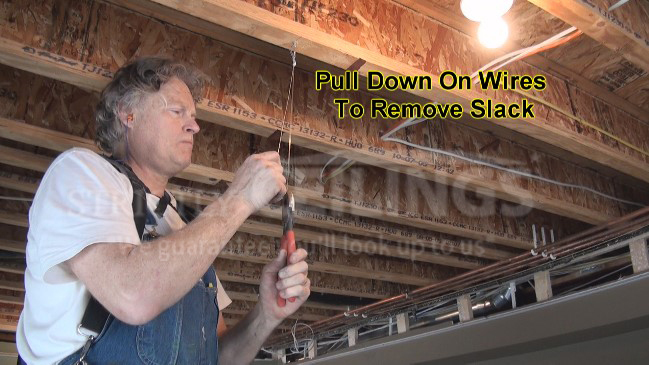 When installing subsequent main runners after the 1st and 2nd mains, always install another string line in-line with the slots and clamp on the opposite wall. This will ensure that all main runners are in-line and square. When installing cross tees into the wall on the first main runner there are two techniques you can use for aligning cut tees into the wall. If you are installing 2×4 lay-in fixtures, remember to always bend over the tabs that will be protruding into the light opening. Otherwise the fixture will push on the grid and throw it out of square. To cut a tee into an angled wall, flip the tee upside down and place it into the wall angle. Align the tee to be straight with the tee that is in the field grid. Then cut the tee about 1/8” to ¼” past the farthest edge of the main runner. Review the full video for in-depth installation help and tips if you are having trouble with any of the procedures.